A Thai museum specialist says that Thai museums need to keep up with international standards in order to attract more visitors to the 1,100 museums in the country. Thai museums must meet international standards with their presentation and promotions to attract more local and international tourists, says Pichet Turongkinanon, managing director of the museum specialist C-Mex. 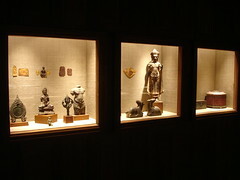 Thailand has about 1,100 museums but fewer than 10 are well-known and highly regarded, he said. “Thailand has a lot of potential to open more museums because we have a wealth of local knowledge and culture,” said Mr Pichet.